Mar 20, 2013: Almost daily, life challenges us in most areas of our lives. For most of us in US, the going has been anything but easy. During these type of periods, there's a great temptation to give in to various type of fears that cross our minds. Because the road ahead is unknown. Usually when we traverse from the known to the unknown we feel scared. But almost all of us know that yielding to fears has never helped anyone. On the contrary such an act paves the way for a life replete with worries, confusion and ultimately, depression. On a positive note, we should be thankful that today's situation has created an opportunity for us to grow and become tough. In short, we've got to face life head on. Upon reflection, we've seen that every new day presents us with great beauty and joy when we watch our life's events unfold in their entirety. Doing so enables us to receive pristine perspectives and new directions. And this fresh new look is what fills our lives with wonder and enthusiasm. In a way, the journey into the unknown is a welcome break from the cage of our "known" ideas about what life "should be". In an unfurling new moment of our lives, we discovered Wally Amos's famous Watermelon Magic. Wally Amos is the founder of Uncle Wally's Muffin Company. 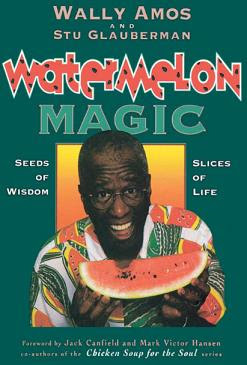 In 1996 he wrote the book Watermelon Magic: Seeds Of Wisdom, Slices Of Life . Today we'd like to share the Watermelon Credo which has helped Amos and many others through rough times. W - Whatever we believe creates our reality. Believe that life is a positive experience and it will be. A - Attitude is the magic word. Our greatest asset is our attitude. Be positive regardless. T - Together everyone achieves more. There are no limits to what we can accomplish together. I am more than I am but less than we are. E - Enthusiasm is the wellspring of life. There is no limit to what can be accomplished with enough enthusiasm. R - Respect our-self, as well as others. When we begin to respect our-self, our whole world changes. M - Make commitments, not excuses. There is overwhelming power in the words "Yes I will!" E - Everyday can be a fun day. Fun is the lubricant that keeps life moving forward. Laugh a lot. L - Love is the answer. Whatever be the question, Love is the answer. It's the greatest force in the Universe. O - One day at a time. How do you eat an elephant? One bite at a time. All of life happens in increments of one. N - Never give up or become a victim. We are guaranteed to lose if we give up. Winston Churchill was right, "Never, never, never give up." It works if we work it. You'd definitely agree that watermelon is FUN as well as inspirational. Let us never allow ourselves to be overwhelmed by our life's events. We are larger than events and have the power to shape them by our beliefs.